During October and from around the globe, alumni from the Rotary Youth Exchange program visited clubs to reflect on their experiences as student. 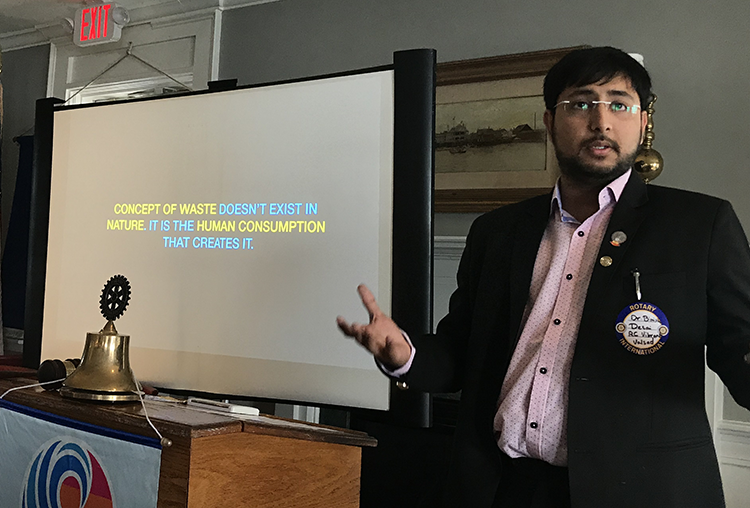 Called Reconnect Week, Dr. Binish Desai visited Marblehead Rotary Club to discuss his company, Eco Eclectic Technology, which conducts research and invents products in pursuit of a clean India. Desai is fond of saying “Nothing is useless in this world; what might be a waste to you is someone’s asset.” In 2005, when Desai was high school age and a Rotary Youth Exchange student in Waukegan, Illinois, he created his first commercial brick from recycled materials. From that experience, his path from Rotary led him to build an entire company on this concept, converting industrial waste into usable products. Fondly referred to as “The Recycle Man,” Dr. Desai is a social entrepreneur who believes that it is our duty to live sustainably. Today, his companies recycle close to 600 tons of waste in India and convert this waste into commercial bricks and toilets for use in rural India. He also produces lighting fixtures in addition to 150 other eco-friendly products. Desai has also designed a course for students on waste recycling. He conducts sessions in local schools and colleges, encouraging students to take up various waste management issues and find solutions. Dr. Desai has received many national and international awards for his contributions such as being youngest to be awarded with "Rotary International Alumni Humanitarian of the Year" award for South Asia, Forbes 30Under 30 Asia 2018 list of successful Social Entrepreneurs.